An adaptation of a Hot Ginger Prawns recipe from one of the many cookbooks that sit on my bookshelves and on the limited counter space in my apartment kitchen. Their glossy and matte covers in no order lend a colorful literary mix to the fictional tales, autobiographies and poetry books I’ve collected so far, written mostly by black authors. Folded pages with hand-scribbled notes serves as a reminder. Prompting at different herbs and spices that stand out in say a stew or a rice dish. Cultural relatability through the use regional ingredients and/or techniques that intrigue me. Yeah, cookbooks are life! I can never read and learn enough on the food of my home, i.e. the entire chain of Caribbean islands. 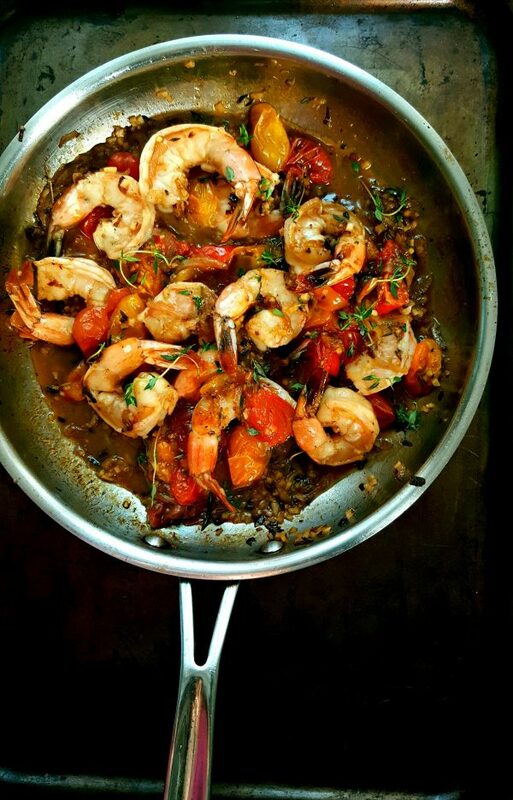 The Hot Ginger Prawns, a mash-up recipe hailing from Jamaica with hints of Asian flavors with soy sauce. 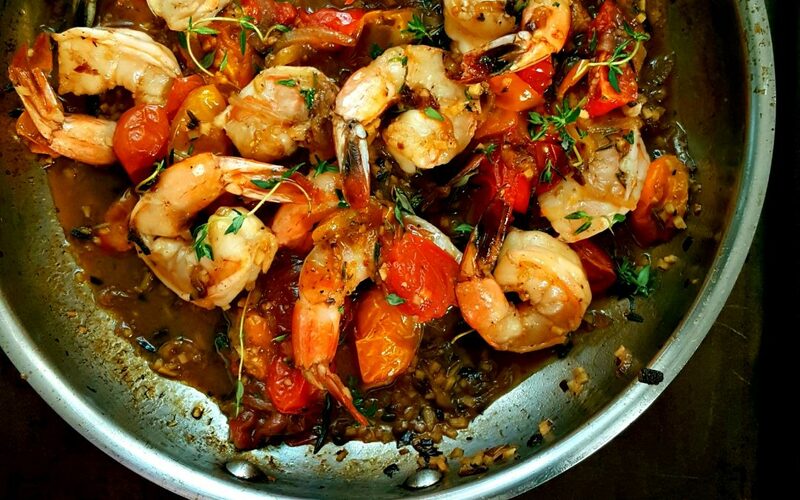 As if one can complement the other’s flavor more, I took four ingredients: shrimp, ginger, tomatoes and thyme, that appear in many recipes in this and other Caribbean cookbooks to make a go-to, single life cooking dish. I must admit, I’ve held on to this recipe some time now but needed to share. Eaten with cooked pasta or supped-up with bread, I enjoy it with slow sips of white wine or an easy rum and juice over ice. Season the shrimp with 1 tsp of salt and ½ tsp of black pepper. Set aside. Preheat the oven the 375 degrees to roast the tomatoes. On a sheet pan, toss the halved tomatoes in olive oil, 3 sprigs of thyme, rosemary, pepper flakes, a generous pinch of salt and pepper. Place in the oven and cook for 30 minutes. On medium heat, add the coconut oil to a hot medium saute pan. Add the onion slices and stir to coat the onions with the oil. Spread the onions out evenly and allow the onions to cook stirring occasionally until they brown. Add the ginger to the onions, stir again and let cook for about half a minute. Move the pan away from the flame before deglazing with the rum. Place the pan back on the medium flame and reduce the rum by half. Add the 5 sprigs of thyme and stock at this point and cook on a rolling boil for 1 minute or so before adding the shrimp. Allow the shrimp to cook for a about one minute of each side before adding the roasted tomatoes and tasting for added salt and pepper. - A dish that takes no time to prepare and cook, I make on days when I feel fancier, but want food my very Trini mother would eat—yuh know. - I used ½ lb. of shrimp (31/35) that feed me for three days. Double the recipe for 4-6 servings. - The ginger flavor is pronounced and bold, cut the amount of ginger in half to tone the bright flavor down. - Unlike baking, I use an actual tablespoon to measure while cooking and not measuring spoons. - I used chicken stock for this recipe, if you have seafood stock handy use it. This, is a lovely, simple, yet surprisingly elegant dish. It speaks to the kind of food that inspire me. As I’m often inspired by many things in almost everything I often cook. I think you forgot to add if it’s tsp or Tbs for the Ginger. I’m guessing it’s supposed to be tsp in the recipe list. This dish looks goes well with a lot of things. Somehow though, I think it would look great, exotic perhaps with some Anson Mills Rustic or Yellow Polenta both. I guess that’s my creative mind thinking out loud. An Asian version would be great involving Soy Sauce and Mirin or Miso Paste. I can relate to your thought with being surrounded by so many matte glossy pages of cookbook inspiration that can inspire, as well food magazines. If I was to cook, adapt a marked recipe I’ve tagged, it would take the rest of my living life to cook them all without making one up originally. I believe all those cookbooks are suppose to serve me some greater purpose still though unknown to me. However, I do enjoy the perspective of Single Life Cooking. It’s obviously appeals as well because I relate to it, yet it’s a voice not often heard or reflected in perspective across so much the community of food blogs. Like always I’m hooked by the flavors shared, but I for one enjoy the stories told. I’ll have to add this as well to my To Make list when I get home in two weeks finally. Thanks for pointing that out, it’s Tbsp as a matter of fact. It’s not called Ginger Shrimp for nothing. Thanks for your kind words as always. I was not purposefully going for elegant, or was I? I guess this is another testament of how simple ingredients can create sinfully delicious and eye pleasing food. And these are the same ingredients that my Ma and Grammies would use on a regular basis too. The original recipe called for soy-sauce but I wanted to use ingredients that was found in most of the African inspired and/or derived recipe in that and other Caribbean cookbooks. Have you been cooking lately? … I had forgotten about the comment until just before now when I was thinking of your blog. 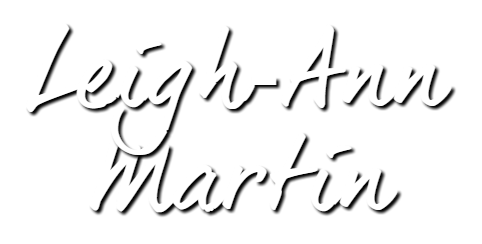 Blogs are like friends, you realize you haven’t seen in a while, so you stop by to say hello. Then you remember you made a comment and stop by to check up. So appreciate the reply. Well, just got home this week as hadn’t been home in quite a long while. I travel for work as a Field Engineer, so often on long projects that last months or many weeks far from home. It’s extremely hard to cook in any capacity when your not home or in your own kitchen. Needless to say blogging as well. So I only got home just a few days ago from being in TX what seems like forever. Only cooked a little just because had to go buy a allot of fresh groceries. But now that I remember, I may try this dish of yours this weekend though I had something else in mind. I understand the use of ingredients, as it also make sense to use ingredients people can find. Like you there are dishes I grew up with and remember my family cooked. I never cooked them until later in life when started cooking. A lot of Local Caribbean food can seem rustic in what one grew up with. They will never get old as favorites! Yet, it’s so broad and diverse a range of food from region. For me their is the food I luv and their is the food I luv that I like to cook see presented in a modern way. I may not always know exactly how to spin it looking modern and elegant, but it’s always a goal in mind to try. I don’t think those two things are in conflict. So my eye, my take is always seeking out a modern interpretation and presentation. With a touch of elegance if possible. And that’s why I also liked the dish. As well your other modern interpretations. As so for me…. they inspire me! More importantly I enjoy the mata-physical stories. As there is just sooooo much more to food, how we think about them, things that causes us to try something, how they inspire, many more things than what most people ever personally write about in a thinking way. That takes a lot of time to as well I personally know too. But their in, I enjoy the shared thought, stories and connecting to them. Yesterday in some inspirational research I came across a mention of a word that was part of a dish watching someone a Chef cook a Caribbean dish in a video series from way way back. It was mention of “Colombo Powder”. It was said to be French Caribbean. Oh Really! On a good clear day from growing up on St.Kitts can see the French island of Guadeloupe. I’d never heard of that “Colombo Powder” though, and a lot of other things French Caribbean I’m sure too. But, how interesting inspiring was that from watching a video. So I curiously googled it. Yet, I found what I learned quite fascinating. But yeah, Inspiration. Could write a blog post about how I discovered Colombo Powder. But that’s another story in itself, if it ever gets written or can focus enough to get back to writing at all. I try to stay inspired. The Shrimp dish is on the menu this weekend though. I made it and lived it. One the best Shrimp dish I’ve ever had actually as well. It thought it was going to be real gingery but it wasn’t, which could of been due to the run which gave it a bit of a sweet taste amid the ginger. Mine turned out a bit saucy than I wanted it as I was reducing down over 2 cups of stock to use and miss judged the reduced stock amount, but that was ok. I can fix that the next time. Anyway luved the actual dish having made it. I didn’t spare a single shrimp. I’ll surely make it again and or in some variation.